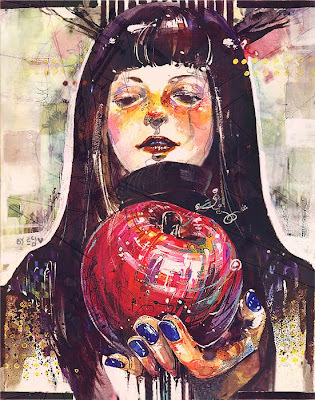 Mary Blairz: Story of Snow White - Art by "12x07"
Story of Snow White - Art by "12x07"
story of snow white by ~12x07... some juicy, energetic pop art to quench one's hunger for bold colours, masterful execution, and tantalisingly awesome loose structuring, with an endearing subject matter in addition to all... how could one resist? Watercolor with white gouache and, if I'm not mistaken, a little Klimt influence in there too. Even with the traditional 'girl holds apple' presentation of the character it still brings some fresh perspective to the story. You can see more of "12x07"s dark work on her deviantArt gallery HERE.